Barbirolli, Beecham, Bernstein, Busch, Furtwängler, Karajan, Klemperer, Koussevitsky, Nikisch, Reiner, Stokowski, R. Strauss, Szell, Toscanini, Walter and Weingartner. This production is superb, and should be in the collection of anyone in the least bit interested in the history of the conductor in relation to western classical music. The time span covered by the virtuoso orchestral conductor is from the 1930s until the late 20th century. This DVD avoids living maestri, and I suppose that the so called �golden era� was before most of today�s living conductors started plying their trade. The video has won all sorts of awards when it was released as a videotape, and I wouldn�t be surprised to see this DVD and its companion win the same accolades. Is the DVD worth buying if you already possess the video? Most certainly �yes�, because of the vastly superior search facilities of the DVD compared with the video. Many of the excerpts are also lengthened, and also there are interviews with various contemporary commentators to enhance the experience. The interviews are illuminating in all cases, except that I find those by Hugh Bean, whilst useful, a bit of a trial due to his somewhat stunted interviewing style. Still the content is superb. 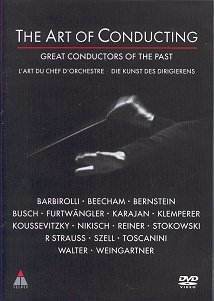 The DVD shows the conductors mentioned above in action both in rehearsal and performance. If I were to single out one excerpt to give you a flavour of why a recording like this is so important, I would choose the famous clip of Furtwängler rehearsing the Berlin Philharmonic in London just after the second world war in the finale of Brahms� Fourth Symphony. Watching this, you can appreciate the life and power that Furtwängler was able to convey to his players. The concentration on their faces says more that any comments I could make to persuade you to buy this disc. Watching these excerpts you may also understand why the older recordings of staple works left to us by these masters continue to be bought by music lovers instead of the chromium plated but generally dull performances issued by many of their successors. There are a small number of complete works on this disc, Weber�s overture to Der Freischütz, conducted by Felix Weingartner with the Paris Symphony Orchestra, recorded in Paris in 1932, and Wagner�s Tannhäuser prelude with Fritz Busch in Dresden in 1932. The fact that nearly all of the remainder of the excerpts are just that is no distraction or indeed shortcoming. The total drive of the programme is to investigate what it was that made these musicians the artists they were, and in this respect, the recording satisfies with flying colours. To maintain the archival nature of the material, the items featuring Herbert von Karajan use his earlier recording of the Beethoven 5th Symphony but colour is used in the Debussy La Mer excerpt. The same applies to the Leonard Bernstein recordings where colour is used only on the second excerpt (Mahler�s 4th Symphony). There is even a film clip of a silent conductor � Nikisch conducting, God know�s what, in absolute silence. Even so this is still fascinating, since it illustrates elements of conducting technique which are true even today. If you hold your baton high, it forces the players to see the conductor�s face. It is the eyes which do most of the control, unless, of course, your name is von Karajan, when other methods apply. A wonderful DVD, one which I will return to many, many times, and there could be no higher compliment made to a recording than this.